Water Treatment with Advanced WiFi Technology in Illinois | Wripli® from Water Specialties Group, Inc.
Once you've installed one of our advanced water treatment systems, you have the option to add a revolutionary feature that will effectively bring your water to life – allowing you to access your water habits conveniently online or by phone app, which is available on iTunes or Google Play. Wripli® is the most advanced WiFi feature in the water treatment industry and is available with our Evolve Series conditioners and EVR softeners. Monitor your water usage, track your water and salt savings, and receive system alerts whenever and where ever you want! Did you go on a trip without turning on your Vacation Mode? Don't worry about it. You can still save on water when you arrive at your destination with the tap of a button! See how much water is currently running through your home in real-time. 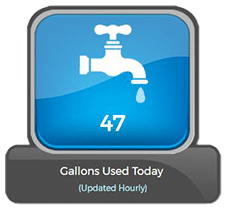 This information is a helpful way of monitoring leaks or unwanted water usage. Allows you to view the gallons of water your home has used during the day. Taking the time to check this daily can help you make adjustments to your water habits. This feature provides a quick look at the largest amount of water flowing through your home over the past week. More details can be found regarding what day and even what time these measurements happened. 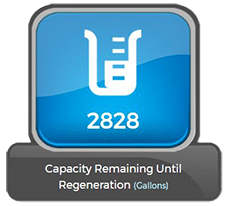 This feature shows you how many more gallons of treated water your system can produce before it requires a regeneration cycle. Regeneration cycles are what sets your system back to full capacity. 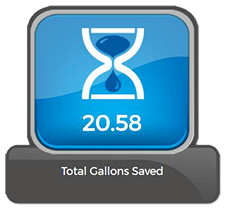 When paired with our Water Efficient Technology™, Wripli® will tally how much water you have saved since activating those features. The gallons you saved are compared to a system that is already considered a "high efficiency" softener, so you will be experiencing maximum efficiencies! 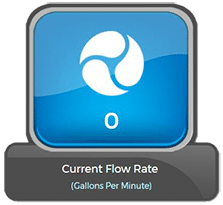 Water Efficient Technology™ helps your system run at maximum efficiency and Wripli® lets you know just how much you saved! 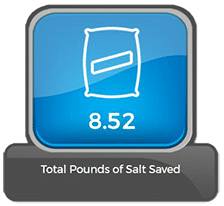 The number displayed is the total pounds of salt that you saved since activating these features. 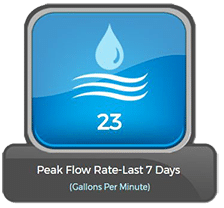 This number indicates how many gallons of water your system will treat before it is time for the maintenance scheduled by your dealer. This shows the number of days before the scheduled maintenance set by your dealer.